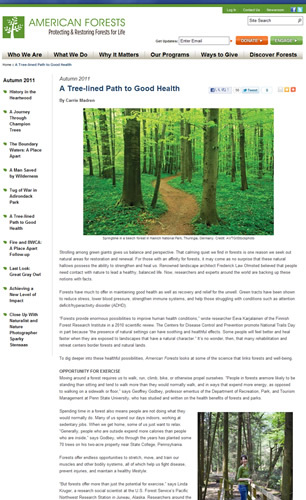 American Forests Magazine reported the research on Forest Medicine conducted in Japan. reported the research on Forest Medicine conducted in Japan. Many published papers by Dr. Qing Li and Prof. Yoshifumi Miyazaki were introduced and cited in the report. The title of the report is "A Tree-lined Path to Good Health".